Take-out windows are all the rage right now. You can get Spanish-spiced kebabs and sandwiches at Moruno at the Original Farmers Market, or, if that isn’t your style, tartines and pastries at Dinette in Echo Park. Still not satisfied with your on-foot noshing options? 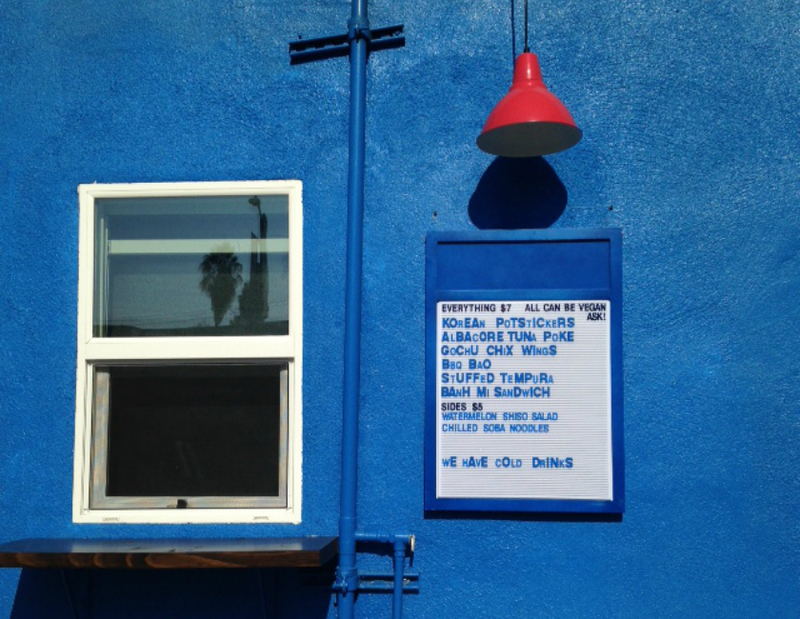 Wander on down for some Asian bites at Blue Window, the new concept from Mud Hen Tavern’s Kajsa Alger and Susan Feniger right next to their Hollywood spot on Highland Avenue. But don’t wait too long: it’s only an Asian concept for six months before the menu turns to something else entirely. The idea for the window came about because Alger and Feniger missed doing the kind of food they served at Street, the original concept they opened on Highland in 2009 and turned over in 2013. It was the first solo project for Feniger, who also owns the Border Grill with Mary Sue Milliken; she partnered with Alger, their longtime chef de cuisine. Blue Window’s current menu is comprised of small dishes for quick meals, things like chicken wings with gochujang hot sauce; pork belly banh mi; tempura-fried, vegetable-filled shiso leaves; and barbecue jackfruit bao. There are only about eight items on the menu, plus a couple of refreshing drinks like Vietnamese iced coffee and Thai iced tea. Main dishes are only $7, sides are $5, and drinks are $3-$6. You can’t miss the window, which is just north of the Mud Hen entryway: The bright Mediterranean blue wall can be seen for blocks. There’s a counter along the wall should you decide to eat right there, or you can take everything to go. “It’s for the workers and locals in the area who just need something cheap, delicious and easy,” says Alger. The window opens on Monday, August 24, and serves from noon-10pm, Monday through Friday.